If you can still remember your New Year’s resolutions, it’s likely that one of them had to do with food. Perhaps it was a pledge to eat healthier, in which case the following recipes may be helpful. Not only are they good for you, but also they are also full of flavor and easy to execute. Preheat oven to 450 F. Scrub and trim sweet 4 medium sweet potatoes and 4 medium turnips, but do not peel. Cut each one into wedges. Toss sweet potatoes and turnips in mixing bowl with 2 teaspoons extra-virgin olive oil. Season generously with Cajun/Creole seasoning. Place on sheet pan and roast until browned and tender, about 20-25 minutes. Makes 4 servings. * Turnips are a source of dietary fiber, vitamin C, potassium, manganese, copper, calcium, pyridoxine, folate and phytonutrients. * Sweet potatoes provide vitamin C, manganese, pyridoxine, tryptophan, potassium, dietary fiber, pantothenic acid, copper, thiamine, riboflavin, niacin and carotenoids. In a heavy, covered pot over low heat, simmer onions and garlic in oil, stirring occasionally, until softened, about 10 minutes. Meanwhile, puree tomatoes and juice in blender. Add turkey, pureed tomatoes and chicken stock to pot, increase heat, and stir to break up turkey. Add remaining ingredients, except for beans, and stir to combine. Bring to a boil, then reduce heat and simmer, stirring frequently, for 30 minutes. Drain and rinse beans, add to pot and cook until beans are heated through. Serve garnished with green onions. NOTE: Eating improperly cooked beans can result in bean poisoning from a plant lectin called phytohaemagglutinin. Though it is found in many types of beans, red kidney beans contain the highest levels of phytohaemagglutinin — only 4 or 5 undercooked red kidney beans can make you sick. Make sure to boil soaked beans for at least 10 minutes (it is important that the water reach 100°C, exposing the compound to 80° C increases the toxicity). A variety of common bean named for its visual appearance to a kidney. Red kidney beans provide dietary fiber and protein, as well as a plethora of nutrients: manganese, copper, phosphorus, magnesium, iron, potassium, zinc, folate, thiamin, vitamin B6, vitamin K and phytonutrients. * Extra lean ground white turkey is 97 percent lean, with only 3 percent fat. * A 112-gram (3.951 ounces) serving has 130 calories, 26 grams protein and 8 milligrams iron. Turkey also provides zinc, potassium, B vitamins, niacin, phosphorus, tryptophan and selenium. Combine olive oil, onion, garlic, celery and carrot in a heavy pot and cook, covered, on medium-low heat, stirring occasionally, until onions are softened, about 10 minutes. Meanwhile, sort and rinse lentils. Add chicken stock, lentils, bay leaf and thyme to pot. Bring to a boil, reduce heat and simmer, covered, until lentils are tender, about 20-25 minutes. Stir in spinach, season with salt and pepper and cook for an additional 5 minutes. Serve with lemon wedges. Makes 4 servings. Spinach is a good source of dietary fiber and protein, as well as vitamin K, manganese, folate, magnesium, iron, vitamin C, riboflavin, calcium, potassium, pyridoxine, tryptophan, vitamin E and phytonutrients. Lentils provide more protein and fiber than other legumes. Lentils also provide folate, thiamine, vitamins B5 and B6, niacin, riboflavin, manganese, phosphorusiron, copper, potassium, magnesium, zinc and phytonutrients. Combine 6 medium carrots (scrubbed and sliced), 4 medium turnips (scrubbed and sliced) and 4 cups vegetable stock in saucepan, bring to a boil. Reduce heat and simmer, covered, until vegetables are tender, about 20 minutes. Puree soup in blender. Season to taste with coarse salt and freshly ground black pepper. Reheat soup. Serve with a dollop of nonfat plain yogurt and sprinkle with 1 teaspoon garam masala. Makes 4 servings. * Carrots are a source of vitamin A, dietary fiber, vitamin C, potassium and phytonutrients. Preheat oven to 400 F. Trim stem ends from Brussels sprouts and remove any discolored leaves. Thinly slice Brussels sprouts. In a mixing bowl, whisk mustard and oil to combine. Add Brussels sprouts and toss until coated. Spread sprouts on a sheet pan and sprinkle walnuts over them. Roast until Brussels sprouts are tender and walnuts are toasted, about 20-25 minutes. Season to taste with salt and pepper. WHEN TO PLANT: Brussels sprouts requires cool weather—plant in early spring for a crop that matures in the fall. SOIL: They like slightly acidic and fertile soil that drains well with plenty of organic materials. SPACING: Brussels get large. Plant 18 to 24 inches apart. SUNLIGHT: Brussles need alot of sunlight. At least a minimum of 6 hours daily; the more the better. WATER: Water after planting to encourage good growth. Mulch to keep the soil cool and moist. Water regularly about once a week if plants don’t receive enough rain. Walnuts are part of the tree nut family which also includes Brazil nuts, cashews, pecans, pine nuts and pistachios. Walnuts provide protein, dietary fiber, vitamin E, vitamin B6, folate, thiamine, manganese, copper, magnesium, phosphorus, iron, zinc, monounsaturated and polyunsaturated fats and phytonutrients. * Thomas Jefferson planted Brussels sprouts in 1812, thereby introducing them to the United States. * Brussels sprouts provide vitamin K, vitamin C, manganese, folate, dietary fiber, potassium, pyridoxine, tryptophan, thiamine, iron, phosphorus and phytonutrients. Preheat oven to 450 F. Separate cauliflower into small florets and place in mixing bowl. Combine anchovies, garlic, black pepper and olive oil in a small bowl and mash with a fork. Add mixture to cauliflower and toss to coat. Sprinkle with Parmesan and toss to coat. Spread on a sheet pan and roast until tender and lightly browned, about 25-30 minutes. If not sufficiently browned, run briefly under the broiler. Season to taste with salt. Transfer to a serving dish and garnish with chopped parsley. Makes 4 servings. A kitchen staple, this allium is native to Central Asian and northeastern Iran. * Cauliflower provides vitamin C, vitamin K, folate, choline, pyridoxine, potassium, dietary fiber, manganese and phytonutrients. 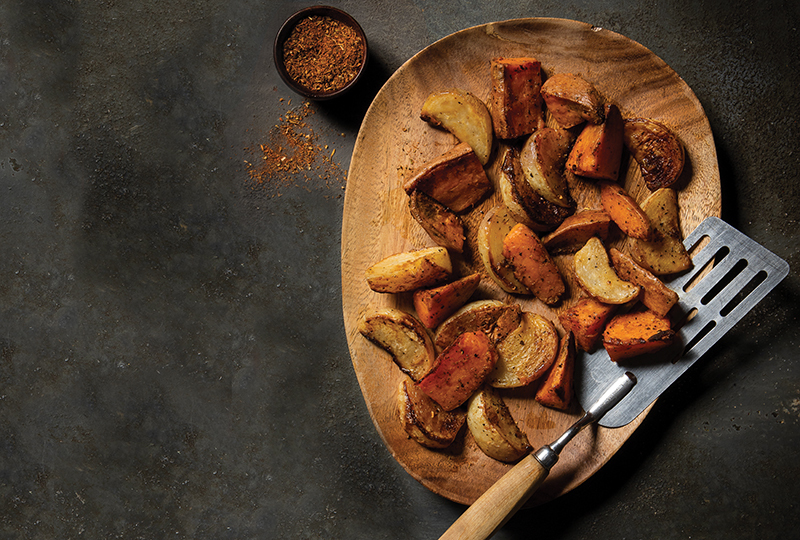 Preheat oven to 450 F. Combine 2 pounds butternut squash (cut into ½-inch cubes), 2 cloves garlic (minced), 1 teaspoon smoked paprika, ½ teaspoon ground cumin, large pinch cayenne, ¼ teaspoon kosher salt and 2 tablespoons extra-virgin olive oil in a mixing bowl and toss to coat squash. Transfer squash to a sheet pan and roast until tender and browned, about 15-20 minutes. Serve over steamed rice, garnished with cilantro leaves and with soy sauce for each diner to add, as desired. Makes 4 servings. Bring a pot of salted water to a boil and preheat oven to 275 F. Cut chard leaves away from stems and roughly chop leaves. Wash under running water, then blanch in boiling water until tender. Drain in colander and use a long-handled spoon to press out water. Transfer chard to an oven-safe container and keep warm in oven. Place chicken breasts and chicken stock in a large skillet, bring to a boil, then reduce heat and simmer, covered, for 5 minutes. Turn chicken breasts and continue poaching until cooked through, about 10 to 15 minutes, depending on thickness of chicken. Transfer chicken to an oven-safe dish and keep warm in oven. Increase heat under skillet and reduce poaching liquid until thick and syrupy. Divide chard among 4 plates. Place a chicken breast on each bed of chard and drizzle them with the thickened poaching liquid. Season with salt and pepper and sprinkle with sumac. NOTE: The use of “Swiss” is unclear, since the plant is native to the Mediterranean, not Switzerland. However, chard is used in a traditional Swiss dish called Capuns. Swiss chard is related to the sugar beet and is sometimes called leaf beet, seakale beet, white beet and spinach beet. Swiss chard provides vitamin K, vitamin C, folate, manganese, calcium, potassium, copper, iron and phytonutrients. * Sumac is a shrub that yields wine-red berries often used in Middle Eastern cooking. The ground berries impart a sour, lemony taste.